SLEEP LIKE ROYALTY: There is no other fabric in the world that compares to the beauty and elegance of pure silk. For centuries silk was reserved only for emperors and dignitaries. 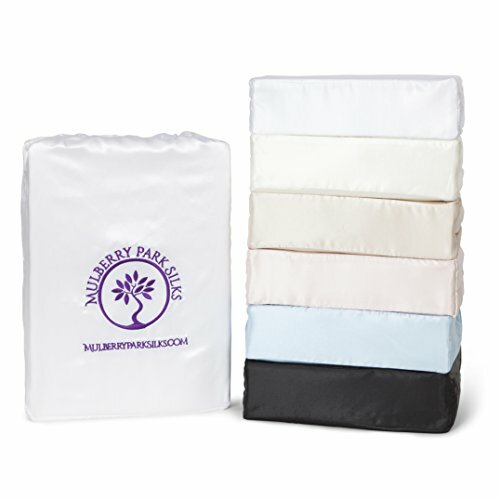 Mulberry Park Silks has crafted all their bedding products with regality in mind. IMPROVE YOUR HEALTH WHILE YOU SLEEP: Silk is often referred as the queen of all natural fibers. Silk is a TEMPERATURE REGULATING fabric that is cool in the summer and warm in the winter. Silk is HYPOALLERGENIC and repels dust mites, bed bugs and bacteria. Silk is a NATURAL PROTEIN with a high content of amino that are healthy for your skin and hair. SHEET SET INCLUDES: One (1) Flat Top Sheet, One (1) Fitted Bottom Sheet and Two (2) Pair Pillowcases. Fitted Sheet Features a 15" Seamless Pocket Construction for Secure Fit. Pillowcases Have an Envelope Style Closure with Generous 8" Flap to Hide Pillow. Made of pure 22 Momme Grade A Mulberry Silk that equates to a 900 Thread Count. OEKO-TEX® Certified (Standard 100) To Be Free Of Chemicals And Naturally Dyed With No Color Shading Or Fading. CARE INSTRUCTIONS: Hand or Machine Wash in Cold Water on Gentle Cycle. Hang to Dry. Cool Iron. Do Not Bleach. Can Also Be Dry Cleaned. SLEEP LIKE ROYALTY: There is no other fabric in the world that compares to the beauty and elegance of pure silk. For centuries silk was reserved only for emperors and dignitaries. Mulberry Park Silks has crafted all their bedding products with regality in mind. Made of 100% Pure Mulberry Charmeuse Silk. IMPROVE YOUR HEALTH WHILE YOU SLEEP: Silk is often referred as the queen of all natural fibers. Silk is a TEMPERATURE REGULATING fabric that is cool in the summer and warm in the winter. Silk is HYPOALLERGENIC and repels dust mites, bed bugs and bacteria. Silk is a NATURAL PROTEIN with a high content of amino that are healthy for your skin and hair. TWIN SIZE SHEET SET INCLUDES: (1) Flat Top Sheet (66" x 96"), (1) Fitted Bottom Sheet (39" x 75" x 15" Deep Pocket) and One Standard Pillowcase (20" x26"). Fitted Sheet Features a 15" Pocket for Secure Fit. Pillowcase Has an Envelope Style Closure with Generous 8" Flap to Hide Pillow. Made of pure 22 Momme Grade A Mulberry Silk that equates to a 900 Thread Count. If you have any questions about this product by Mulberry Park Silks, contact us by completing and submitting the form below. If you are looking for a specif part number, please include it with your message.